As business owners we’re all stretched to the limit with our time. We wear so many different hats that a lot of the time we don’t know whether we’re coming or going! I get it, I really do… believe it or not, I’m the same with my own business! My days are spent working with my coaching clients, trying to come up with ways to help them be more productive as well as helping them to remove their admin headache and focus more on their paying clients. I work with a handful of lovely coaches, and it’s in my interest to use tools which not only save me time, but are also good enough for me to recommend to my clients. 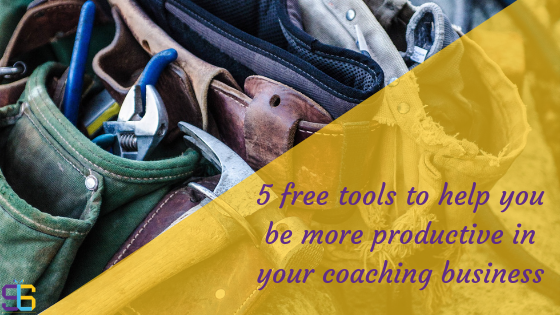 In this post I’m sharing 5 tools that I use every day, which may also help you be more productive in your own business. These tools all have paid “pro” versions, however the free accounts work just as well, especially if you’re a start-up and need to watch your cashflow! This is a great tool to help manage your social media accounts, specifically scheduling your social media content. The free version allows you to manage 3 social media accounts and schedule up to 10 posts at any one time in each account. I’ve used Mailchimp since starting my previous VA business in 2010 and it’s come a long way from the basic newsletters it used to do for free. You now have access to landing pages, you can create a series of automated emails, segmentation of your customers/subscribers, and of course the great newsletter function. It’s very easy to use and has a good knowledge base & tutorials if you get stuck. Their free version is very basic but if that’s all you want to begin with then it’s ideal. It’s very user-friendly and is a straightforward way of getting your clients to make an appointment with you at a time that suits you. You don’t even need a website to use it as it creates a shareable link to your stand-alone scheduling page. Canva is brilliant for creating anything visual – from social media posts, ebooks and brochures to infographics, invitations and presentations. You can upload your own pictures to use or choose any of the free ones in their gallery. Google Drive is a free cloud storage & file synchronisation service which is accessible via your Google account. It comes with 15GB of storage and is easy to use. You can upload your own files & folders to share with others, as well as create Google Sheets, Slides and Documents – which are very much like Excel, PowerPoint and Word but with less functionality (but then it’s free 🙂 )! I know there are a lot more free tools out there that do the same as the above however these are the ones I’ve used for a while, both in my own business as well as my clients’, so I know they work! I hope you find them as useful as I have.